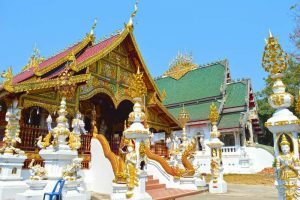 Chiang Rai, Thailand. 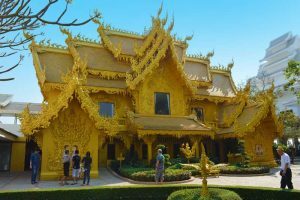 Everybody you run into who has ever been to Thailand claims you MUST go here. Is it really all that great? 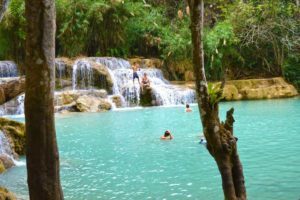 Bye bye Luang Prabang, Laos, Hallo Chang Rai, (photos here) located in Northern Thailand; not quite as trekked as the south, known for it’s limestone cliffs, the White Temple, pristine nature, elephant sanctuary, culinary delights and ancient long necked village tribes. Also, if you believe the travel hype, the place you must go! Let’s find out if it is all it’s cracked up to be. At 11 am, via the Night Bus from Laos, we finally arrived. 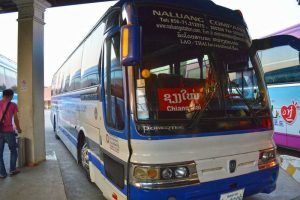 If you need to know how to take the Nightmare Sleeping Bus from Luang Prabang to Chiang Rai, and what happened in between, you can read about it here. 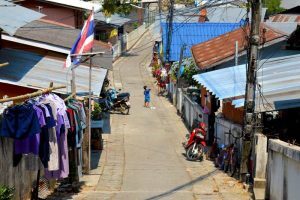 The sun was shining, the roads were smoothly paved and washrooms were so much cleaner; these are the first things that stand out in stark contrast as we make our way into beautiful northern Thailand, as opposed to our previous destination of Laos. On arrival at the bus station, many smiling men politely offered their tuk tuk services. Mr. Manat offered his services for the best price of 100 baht and promptly took us to our hotel Baan Siri. We arrived very tired and in desperate need of a shower, but were firmly told no checkin until 2 pm.? Not so happily, we deposited our luggage with them and headed out for the short walk to downtown. First on our agenda was Thai SIM card which we found quickly at a 7-Eleven; one card was 300 baht (USD$8.75) for 7 days. It seemed a little expensive, but not too bad if you need to be connected. Hunger quickly overtook our need for sleep as we found a cute little cafe called Lumdee. After our meal, we made the 20 minute walk back to our hotel, checked in and had a heavenly shower in our wet room. Feeling wide awake after our showers, we decided to make the most of our time and instead of going to bed for a nap, we headed to the Saturday Night Market, also known as the Walking Street Market – not to be confused with the tourist Night Bazaar, which is every night. 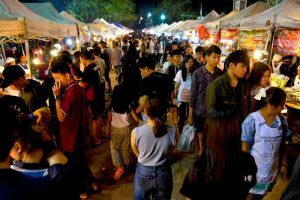 People often flippity say once you have seen one night market, you have seen them all, Wrong! This Market was huge! We walked, browsing for a few hours and I am certain we only saw a small portion of it! Filled with culinary delights, arts, crafts, clothing, electronics and so much more, it makes your head spin. 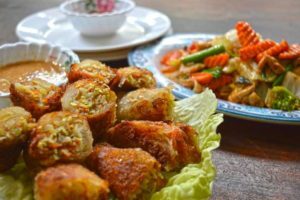 Instead of eating at the market, we went in search of a dining restaurant which eventually found us in Sawaddee. 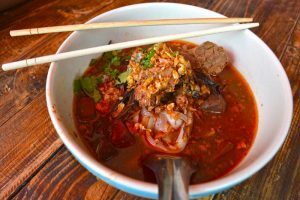 This fabulous restaurant with excellent service was located on the second floor of a building overlooking the Night Bazaar, which made for entertaining views. On our way back to the hotel, we stopped by a hot pot open air restaurant for a beer & water because we saw a football game playing. It was still half full with locals drinking, eating and watching the game. Nobody understood any English, or did not let on if they did, but we, and they sure laughed a LOT!??. The next day we got up early, ready to take on a full busy day of sight seeing. 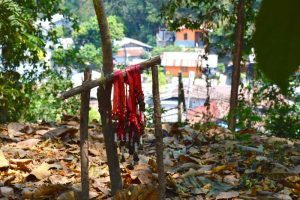 We walked for hours through and around the city observing temples, markets, the Mae Kok river and a beautiful resort. 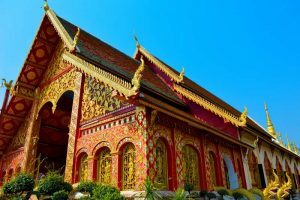 Link to a List of top things to do and a Temple Challenge! After a very late lunch of 7-Eleven self made ramen noodles (almost free? ), we ventured through a huge?indoor market which we accidentally wandered upon. If you need anything cheap (great prices), this is the place. 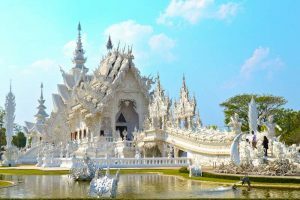 Mid afternoon we grabbed a **tuk tuk from hell for 150 baht to the White Temple / Wat Rong Khun. Our old driver horrified us during the 30 minute drive; every time he stopped, he would rev the engine of his junker and basically pop the clutch when taking off, practically dumping us out the back.? We learned to remind each other to hang on. His tongue was always hanging out, perhaps in concentration, but every time I tried to take a picture, he caught on and would pull it back in. ? 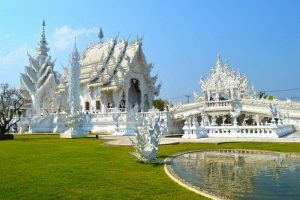 The White Temple Wat Rong Khun was gorgeous; glittering silver and white. Definitely worth the hell ride! 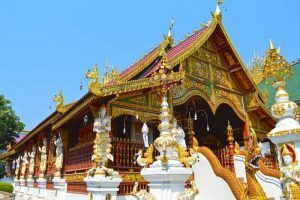 **Alternatively according to Wikitravel, It's easy to get to the temple by public transport: there is a public bus from the Chiang Rai bus station (20 baht, 30 min; platform 8, but ask driver or counter). To get back, flag down a public bus or songthaew from the police station on the left side of the road leading back to the main highway. 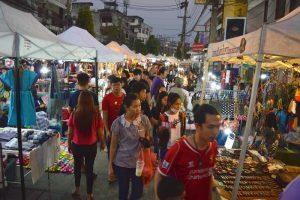 Our second and last evening, we wandered around the Night Bazaar, and had another fabulous dinner at Sawaddee. 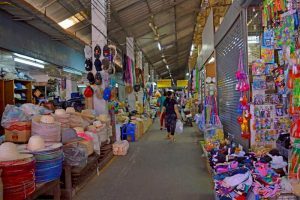 On our final day, we grabbed a taxi to the Green Line Bus Station for 60 baht (USD$1.75) and bought our tickets to our next destination Chiang Mai for 166 baht each (USD$4.85), leaving at 11:30am. 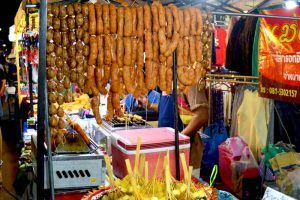 With time to kill and empty stomachs, we strolled up the street to Baan Chivit Mai Bakery and Restaurant – a feel good Bakery ??. 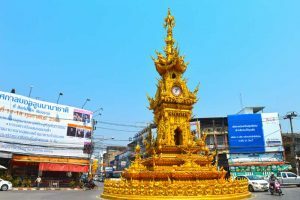 ¹Baan Siri hotel is a short 10 minute fast walk (20 minute stroll) to downtown. Oh, and to answer my question: Is it really all it is Cracked up to be? Yes and no – At first we couldn’t see past the fact that this was just a city and we had expected so much more. The not so trekked path was overrun with backpackers! 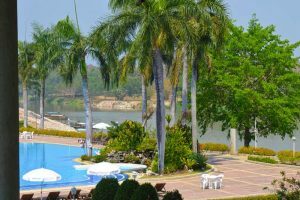 But, by the end of our time here, and in retrospect, Chiang Rai is definitely a place to visit! What do you think? Use the comments section below to let us know about your experience, feelings or questions regarding this Northern treasure. 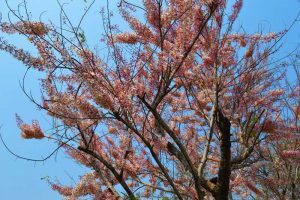 In the beautiful mountainous northern part of Thailand is the city Chiang Rai. The best way to enjoy this city is on foot! Below are some of my photo moments. 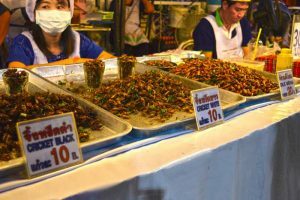 Bugs for Sale – to Eat! 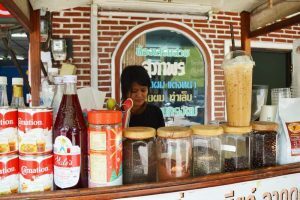 Street Side Coffee Shop – it was delicious! 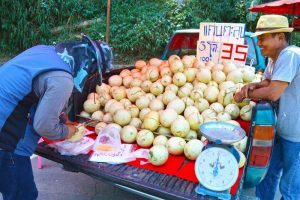 Roadside Melon Treat – so sweet! 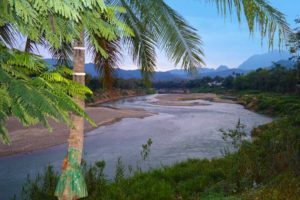 Sleeping Bus from Luang Prabang, Laos to Chang Rai, Thailand – the most comprehensive step by step guide, complete with pictures. 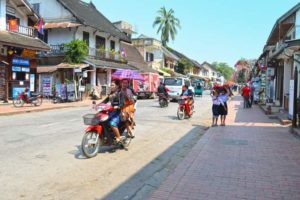 Following a short, busy, stay in Luang Prabang (read about it: What to see and do in Luang Prabang), we went to a roadside tour agency to investigate our transportation possibilities to Thailand. 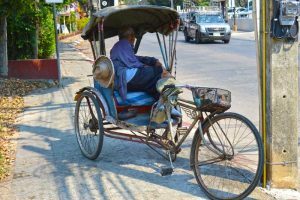 After careful consideration and weighing the pros and cons, we decided we would lose the least time by taking the sleeping bus from Luang Prabang to Chiang Rai. Almost all tour agencies sell the tickets; we paid 270,000 kip per person (USD$32.75). After some intense questioning, and the sales lady getting irritated with us, she presented pictures of a bus with single “bunk beds”, slightly rough looking, but we figured we should be able to sleep. She frustrated and angrily reconfirmed this was the sleeping bus we would travel on. ‼️Reality Shock:‼️ It was NOT a sleeping bus with beds, rather a bus with reclining seats, however, the seats were big and fairly comfortable - at the beginning, not so much by the end.? They kept the bus fairly cool, so make sure you have a sweater along. Luggage is stored underneath the bus, and there is overhead space for a small backpack. Our bus was full. There is no wifi. There are no lights for reading a book. Our 1st stop was at 8:45 pm for 15 minutes. Everyone stumbled sleepily off the bus, so I guess I am not the only one who had managed to fall asleep. Toilets here were disgustingly dirty and there is never any soap – be sure to have tissues and hand sanitizer along. 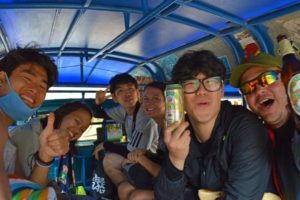 We bought 2 apples and some peanut brittle for 19,000 kip (USD$2.30) and crawled through the ditch back onto the bus. I cut my foot open on a bottle in the ditch. Was this a forewarning of bad things to come? Note to self: be careful of the garbage laying around. 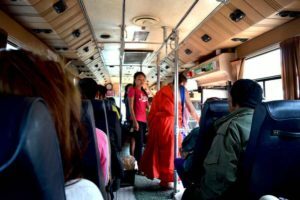 Inside of the Night Bus from Luang Prabang to Chiang Rai – not what we were promised! Next stop was at 12:20 am – I briefly woke up and glimpsed out the window; everything was pitch black, so I guess it was a smoke and washroom stretch break. By 12:23 we were on our way again. When the driver stops the bus, lights are turned on, and left on until the bus leaves again. What I thought originally, to be comfortable seats, quickly became a nightmare; perhaps great for a trip of a few hours, but unpleasant to say the least for a night trip and almost impossible to sleep (nap yes, sleep no). More stops were made at 1:52 am and 3:00 am (?just so males could relieve themselves in the ditch) and finally again at 5:45 am. By this time I had to pee so bad, but the washrooms were all locked. Finally, after a lot of jumping around a lady came and opened them. We parked and didn’t leave again until 7:34 am, I am going to assume they were waiting for the border to open. 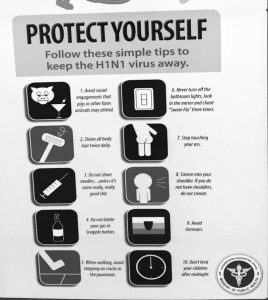 ?Tip: make sure you have mosquito spray along. The door was opened and the bus was turned off leaving us wide open for the dawn mosquito attack! The border came into view at 7:42 am. 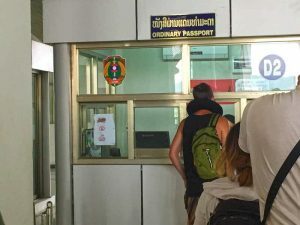 Everybody hopped off the bus and got in line to present our passports to the Laos exit authorities. 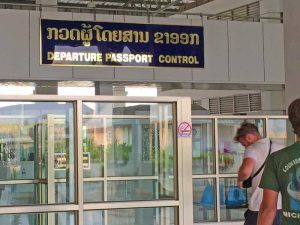 You must pay either USD$1 or 10,000 kip to exit, (I think only during off hours or weekends), get your passport exit stamped and re-meet the bus on the other side. To the left is the shuttle bus counter; at this point, if you need a shuttle you pay for where you want to go. 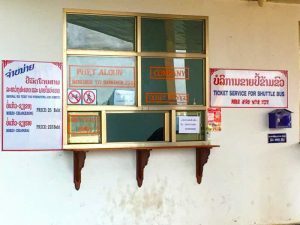 To Chiang Khong (the Thai Border office, because you are not allowed to walk) is 25 baht (USD$0.75) or alternatively to Chiang Rai is 225 baht (USD$6.50). 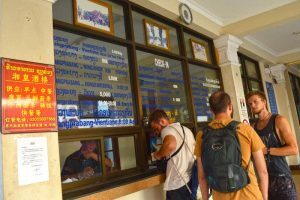 It was included in our ticket, so we hopped back on the bus and within a few minutes it was crossing the Friendship Bridge over the Mekong river to the Thailand border side where we exited the bus once more at to be processed by immigration. Everyone was instructed to take their luggage with them. 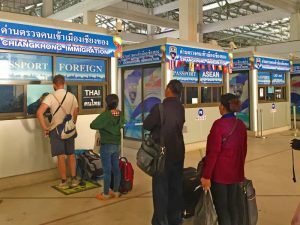 You are given immigration papers to fill out and then you proceed to the Thai customs booth to get entry approval, after which you get your luggage scanned and then you have finally arrived in Thailand. ?FYI: On the right hand side is an ATM machine so you can easily pick up Thai baht before going any further. Also in a separate building on the right are fairly clean washrooms. The bus was on the road again by 8:37 AM making the total time to cross the border 56 minutes with a cost of 10,000 kip (USD$1). 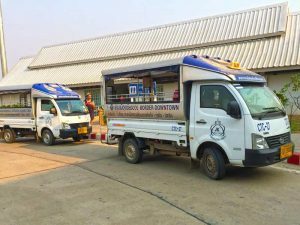 For those who are not getting back on the bus / have purchased transport to Chiang Rai, the shuttles are waiting on the right hand side. Next stop: Chang Rai, which maps.me says is 2 hours – and so it was, almost to the minute. Worth saying:?our bus driver was amazing. His eyes never left the road and he was constantly scanning and using his mirrors. It felt very safe. Oh yeah, I almost forgot – The ride was boring and uneventful (thank goodness); I can’t even brag about the wonderful countryside scenery as it was too dark to see anything. Simply winding, twisting and bumping along through the dark with an occasional light sleep in between. But let me tell you about the time the pirates… ? 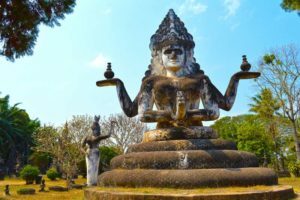 Buddha Park, Vientiane, Laos and How to Get There by Bus, Cheap! 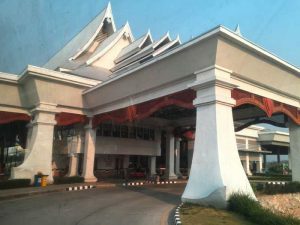 First, get yourself to the Vientiane Center; this place was a shock to us. Everything in Laos seems so not advanced and then here, amongst the dust and dirt was this beautiful oasis of a shopping mall. 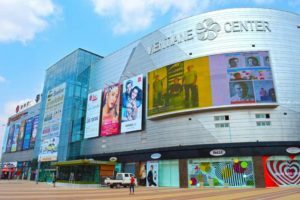 Leave yourself some time to explore this monster if you are in need of shopping or just some air conditioned relief. We walked from our hotel, so it wasn’t too far from the town centre / hotel district. Beside the mall, you will see the bus station – this is NOT where the bus leaves from, but it is the general area. Turn right towards the street market, watching the side streets on the left. 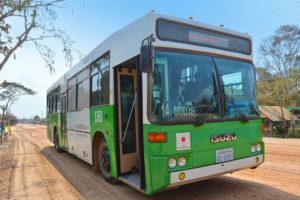 Hopefully, you will spot a big bus with the display panel lights (above the windshield) advertising Buddha Park #14 – ask to make sure and get on to this wonderful air conditioned transport. 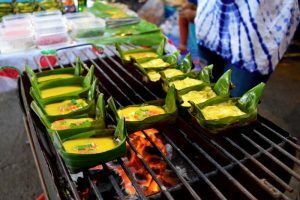 Warning ⚠️: People lie – they give wrong directions, say there is no bus and try to sell tuk tuk and taxi services. Our bus left at 12:40pm, FULL; not sure if they waited until it was full to leave or if it actually leaves at a scheduled time. The back row of the bus was completely taken by Monks; cool sight. Don’t worry about paying yet, it will happen later, either with a collector or when you leave. If you have data on your smartphone, you can load the Lao Bus Navi and map. Here, you can see the bus route, click on it to confirm the price, or choose other routes!? This is advertised on the bus, a little late for our purposes, but lucky you, I wrote it down. On arrival, we exited the front door, like everybody else, and paid the driver 6,000 kip per person (USD$0.73)? one way; entrance to Buddha Park was free. FYI: Our bus took 1 hour for the trip, but most certainly it varies as the bus makes many stops. I think, based on observing, you can flag it down anywhere along the route. We spent a leisurely 1.5 hours in the park. ?Tip: take a lunch & do not forget water! There are a few stores and a restaurant there, but we did not purchase anything, so I cannot tell you how the prices were. You catch the bus back to Vientiane on opposite side of the road . Last bus is at 4:45pm. This time, a money collector came through and collected the bus fare money, another 6,000 kip. ?Note: Make sure they do not rip you off – they will try; either have the exact amount or make sure you get your proper change back! 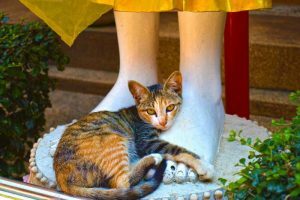 For more photos of the mystical Buddha Park, click here. Q. 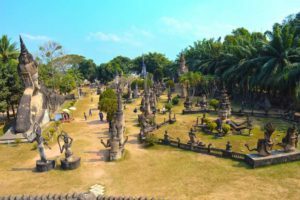 Should I go to Buddha Park / Is it worth it? A. Definitely! How often will you see so many Buddhas in one place? Q. 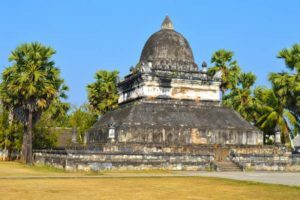 How long does it take to get to Buddha Park? A. Our bus took one hour. It varies depending on how many stops the bus makes. Q. 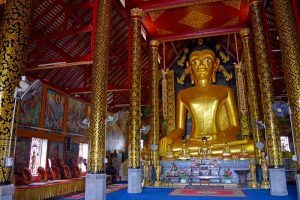 How much does the bus to Buddha Park cost? Q. 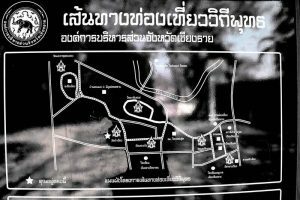 How much is the entrance fee to Buddha Park? A. I have seen all kinds of different prices on the internet, but there was no charge when we arrived… maybe only in the morning, I don’t know. For us it was free. Q. 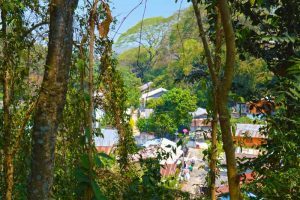 Is there somewhere to eat at Buddha Park? A. Yes, there is a restaurant, as well as a souvenir store. Q. How much time will I need at the Park? A. I think 2 hours should be generously more than enough, unless you plan on having a picnic! Q. 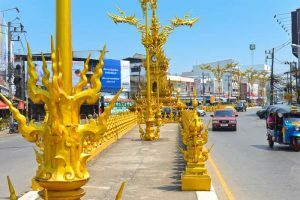 What time is the last bus back to Vientiane, Laos? A. The last bus is at 4:45 pm. Please use the comments section below if you have further suggestions, questions or tips as well as any changes in the above info. Thanks! 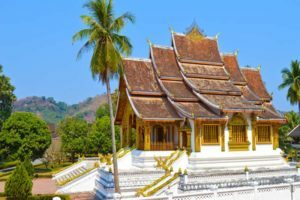 Destination Luang Prabang, the little city in the limestone mountains of Laos, boasting the reverent Alms Giving Ceremony of the monks, the incredibly beautiful Kuang Si Falls, Temples and quaint cafe lined cobblestone side streets waiting to be explored. 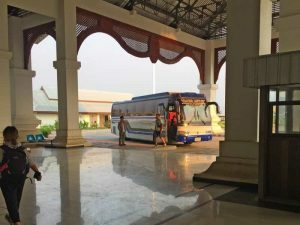 We took the 9am VIP bus from Vang Vieng to Luang Prabang for 80,000 kip (approx. €9) per person. Read about our transfer experience and how to HERE. 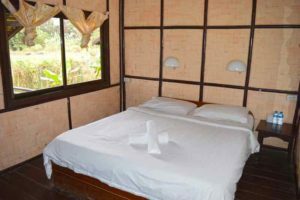 We arrived at Villa Aphay and negotiated a high price of 172,000 kip (USD$21.25 per day) for the “big” supposedly last room left. ?If you are in 3, the price looks a whole lot better! It had a king size bed as well as a single bed. The older man running it is a little creepy – he asked me several times if I was married to my husband then said my husband is too young for me ??. When you leave the hotel, he makes you leave the key behind in a basket. Heading out the room door it says to turn the lights off when you go out, so we turned all the lights out but left the fan on to try to keep the air a little cooler (no air conditioning at our price). When we came back the fan was off, so we know he came into our room while we were gone.? 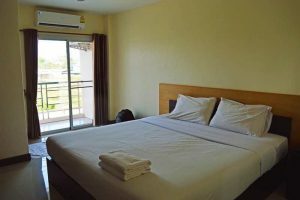 The room itself was very clean, the bathroom, as usual in Laos, was not so clean. We showered and headed to Canadian ? themed Utopia, a tip from our Korean friends. Nice groove, great music, soft lighting and a back garden overlooking the river. 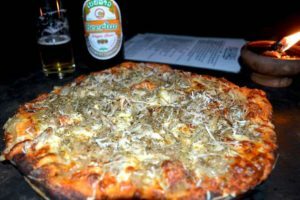 Ordered a large Beerlao and a Somersby cider with a pizza to share as an appetizer. Pizza was American style thick crust, not our thing, but maybe yours; flat flavour – after a few bites, we set it aside. Then we ordered chicken poppers and loaded fries, also to share and again, they failed to impress. I think, if we come back for a second chance, we will stick to drinking only. 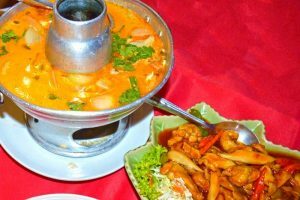 Our bill was a whopping 186,000 kip (USD$23.00) – ?our most expensive meal in Laos. 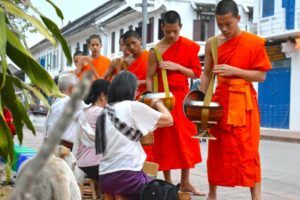 At 6:00am the following morning, we headed to the Main Street to observe the Alms Giving Ceremony of the Monks. 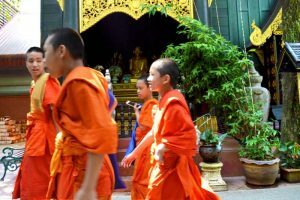 It was a wonderful, humbling experience to watch the monk procession. There were quite a few people there, many disrespecting the etiquette/ courtesy rules of the ceremony. Note Ceremony Etiquette: Be there BEFORE the monks arrive. Do not intrude in the ceremony in any way, keep a distance. No flash on cameras. Do not follow the procession. Ladies cover shoulders and knees, keep head lower than monk (I sat in crouching position). 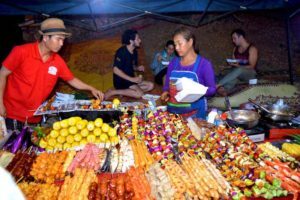 On our way back, we bought 2 fried bananas for 2,000 kip (USD$0.25) – delicious! Definitely try this. Visoun Restaurant was our breakfast choice as not many places are open this early in the morning. 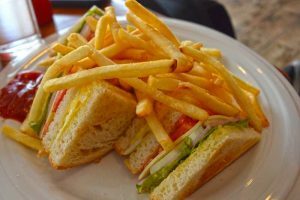 We ordered 2 iced coffees and one chicken sandwich; the sandwich arrived after 15 minutes, and you guessed it, no coffee ?. We were supposed to leave with our friends at 8:30, so we gave up on the coffee, paid for the sandwich and left. 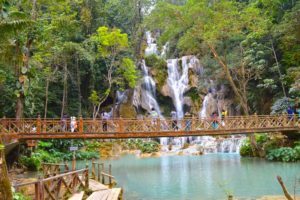 Our group of 7 took a tuk tuk for 30,000 per person (USD$3.70) to Kuang Si Falls; a 20,000 kip (USD$2.50) entrance fee included the Bear rescue centre, Tat Kuang Si. 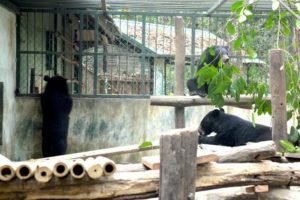 I have mixed feelings regarding the bear sanctuary, really in the end you are swapping one cage for another?!? The falls are a picture paradise. There are a few areas where you can swim, so bring your swimsuit. 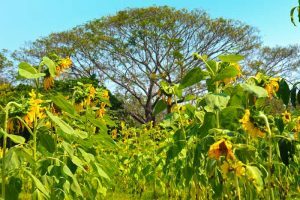 You can hike to the top, but it is slippery and sometimes steep, so make sure you have sturdy shoes along. I climbed halfway before making the precarious journey back down. All I could think is “if I fall, there are NO hospitals around“.? Second chance at Utopia, where we met up with friends. Ordered 2 beer, 1 7up and a glass with ice for the 7up; our waiter set our drinks on the table along with a bucket of ice. I took two ice pieces for my soda, and later we were charged for a bucket of ice ⁉️ !!!!!! Several people who were sitting with and around us promptly came to our defence and although the staff demanded payment for the ice, we only paid for our drinks and walked out.? The evening found us walking to and through the night market. 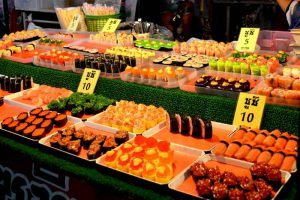 Unremarkably similar to all Asian night markets; lots of food stalls, crafts and clothing. 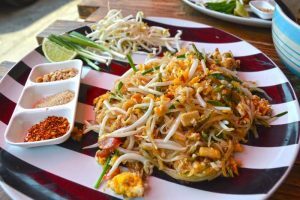 Rather than eating at the market, we strolled to the waterfront where we had a dinner of spring rolls and pad thai washed down with Beerlao at restaurant Lamache. 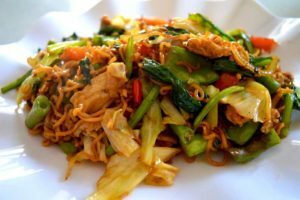 As is always the case, on our last full day, we discovered the Bamboo Restaurant – DO eat here! 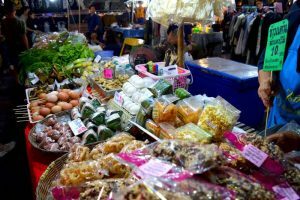 It is a cute, clean and relaxing place with great prices as well as very tasty food located almost in front of Wat Visoun. The huge portions of chicken fried rice with egg, Pad Kee Mao, mixed fruit shake and Iced coffee came to a grand total of 50,000 kip (USD$6.15)! Our last day found us rushing to visit the sites which we hadn’t had the time to visit before. 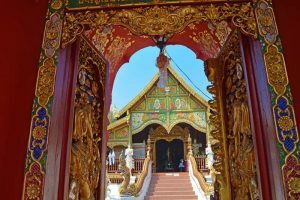 Our first stop was the 100 meter climb up the sacred Mount Phousi, home to the Wat Tham Phou Si, around half way up, and the Wat Chom Si (Phousi Stupa) on the highest peak. 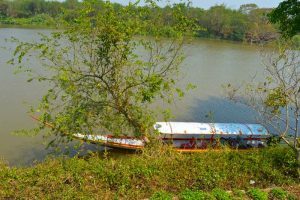 The views are incredible; from the top peak you have views of the city, the Mekong River and the Nam Khan River. 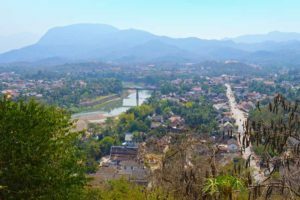 We headed back down the mountain on the opposite side, which led to the picturesque Old Quarter of Luang Prabang. 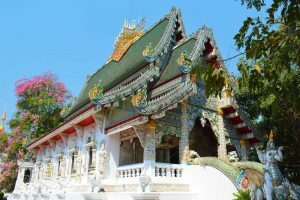 The Ha Pha Bang Temple, which is conveniently located at the Royal Museum was the first building to greet our eyes on the way down. I really appreciated the simple beauty of this specific temple. Lunch found us with friends back at the Bamboo restaurant where we feasted on a huge bowl of Tom yum Luang Prabang Soup, a dish of Pad Kee Mow, the Chicken Fried Rice with an egg on top, Beerlao and fresh squeezed lemonade. This time our total came to 78,000 (USD$9.65). Knowing we would be travelling all night, it was worth filling up. ? 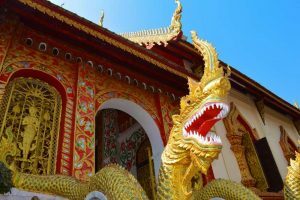 Still having some time to kill, we went across the road to the Wat Aham Temple, Wat Visoun Narat, and Wat Wisunalat. Our friends graciously offered us their room to shower and change before sadly saying our goodbyes. Thanks again guys!!! 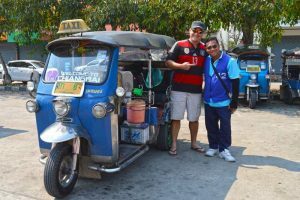 A tuk tuk for 30,000 kip (USD$3.70) took us to the mini bus station where we were to meet our booked night bus to Chiang Rai, Thailand! Bus ticket: 270,000 kip per person (USD$33.50). 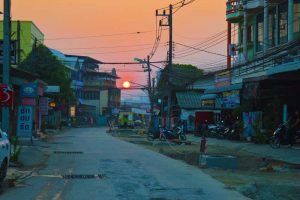 Read HOW to take the night bus from Luang Prabang, Laos to Chiang Rai, Thailand. 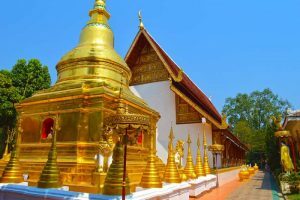 Visit our Luang Prabang Photo Album Here!